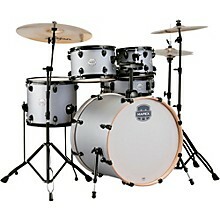 The Mapex Storm Rock set is the best complete drum set perfect for the first time player needing a set with all of the hardware included. The all poplar Mapex Shells have the Mapex SONIClear™ bearing edge making tuning very simple and gives the drums plenty of tone. 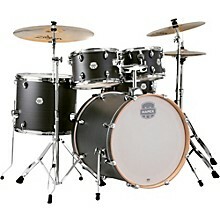 The 22" bass drum delivers a punchy low end. 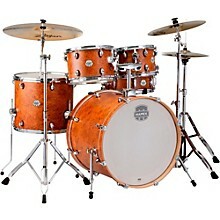 All of the hardware is double-braced and along with the drums boast one of the best warranties in the business. Every Storm set has poplar shells with Mapex SONIClear bearing edges for quick and effortless tuning. Shorter tom size depths deliver instant full tone and allow for easier tom positioning. 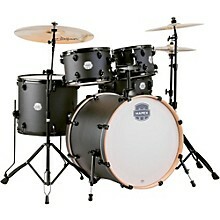 The newly designed Storm hardware is rugged, with three tiered cymbal stands for maximum adjustments. Tom(s):	10 x 7, 12 x 8 in. Snare:	14 x 5 in. Finish and hoops - one year warranty. Hardware - 2 year warranty.